Today’s posting looks at marketing in public policy. It seems particularly appropriate given recent reports that the UK government is scrapping plans to introduce a ‘pay as you throw’ charge for household waste and, instead, is promoting schemes that reward recycling efforts. The two policies follow a very different approach to influencing behaviour. The former penalises an undesirable behaviour, while the latter rewards a desirable one. It is a case of punishment vs. reward – or stick vs. carrot – strategy. Is this change of policy simply a gimmick or does it really matter in terms of shaping rubbish disposal behaviours? The ‘stick approach’ relies on the principle that we strongly dislike incurring losses*. Namely, as posited by behavioural economics, generally we dislike losses more than we like gains of an equivalent amount. However, this approach focuses the households’ attention on what they are doing wrong, rather than telling them what should be done, instead. 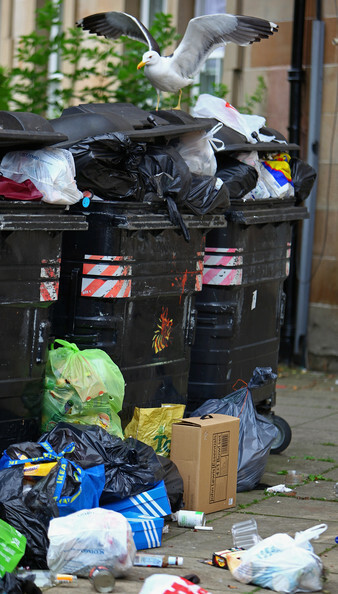 For instance, the ‘pay as you throw’ charge might encourage fly-tipping or prompt people to burn rubbish at home, which would be positive for the household in question (by avoiding the additional charges), but would be very negative for society. In contrast, the ‘carrot approach’ focuses on the desired behaviour: getting households to sort and recycle domestic waste. The message is clear and easy to encode, thus improving the likelihood that it will be noticed and that there will be a matching relationship between the stimulus and the intended outcome or, in semiotic terms, between the interpretant and the object of the sign. In fact, local governments would be well advised to draw on yet another consumer behaviour insight: the power of social norms. Social norms outline the expected behaviour in the relevant group, directing, coordinating and controlling collective action. In other words, it is the power of peer pressure – as exemplified in this statement by Thorntons (the idea being that if 2/3 of consumers opt for this brand on mothers day, then so should you). Furthermore, research into the effectiveness of public service announcements has found that individuals whose attention was drawn to the widespread littering of others littered more, not less, as a consequence. Therefore, it is important that the message focuses on the widespread adoption of the desired behaviour, for instance, how recycling rates have increased in the neighbourhood, or the popularity of the reward programme. In summary, and as far as households’ waste recycling behaviour is concerned, rewards should be more effective than fines, and attention should be drawn to the prevalence of the desired behaviour among the relevant social group. Posted on June 7, 2010 October 1, 2012 by anacanhotoPosted in UncategorizedTagged Behavioural Economics, Consumer behaviour, Social marketing. Previous Previous post: The power of labels – Does a rose by any other name smell just as nice? Interesting. From a marketing perspective, I think you have a good point that the ‘carrot’-strategy works very well. Especially if supported by a campaign to highlight the successes. It’s a very positive approach to change, and I’m a big fan of that. But I think, to get even better results in terms of waste reduction, you need to look at the complete value chain, and see where gains can be made, and how you can use both carrot and stick to get the most effect. For one thing: producers of things or packages that harm the environment have now no incentive to clean up their act. Also, often the cost of their environmental impact (it’s not only the end-consumer responsible for that) is often externalised. Meaning: they are not included in the price of their products (or packaging), but reverted to society as a whole, and thus the tax-payer. This is one reason I like the European ETS for the airline industry so much: it combines carrots and sticks to put the cost of pollution back into the pricing of the polluting product, with a reward for those who reduce their impact through different ways.